Over the last few months I have brought quite a few of Essence's top coats, all of which I use quite regularly, and thought I would do a swatch and review of the different one I own. 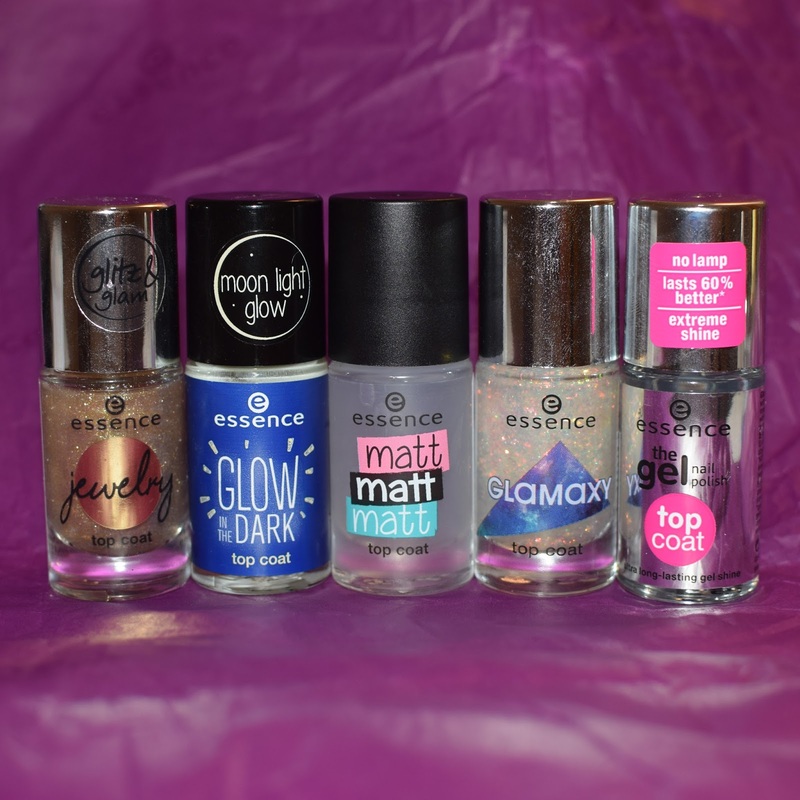 I love Essence top coats, they are all great quality and super affordable. This is a classic glossy top coat, although I don't do my nails with a glossy finish as much as I do matte, this is my go-to glossy top coat at the moment. It is great for nail art and stamping because it doesn't smudge my designs (see this polish used in my stamping top coat comparison here). It dries fast and is super glossy. 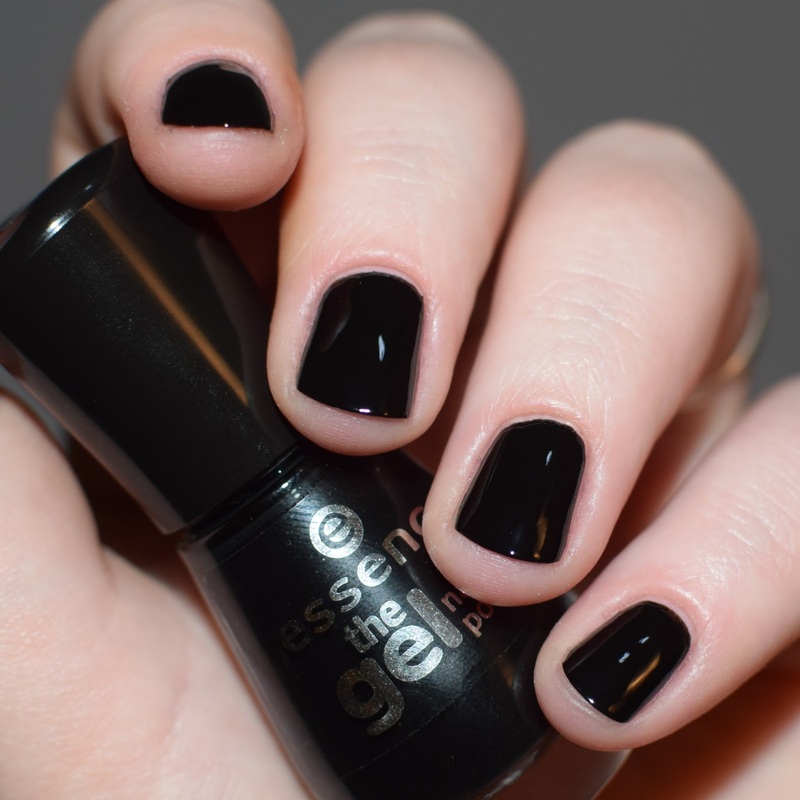 This is the only one of the top coats that doesn't have a name, it is simply The Gel. 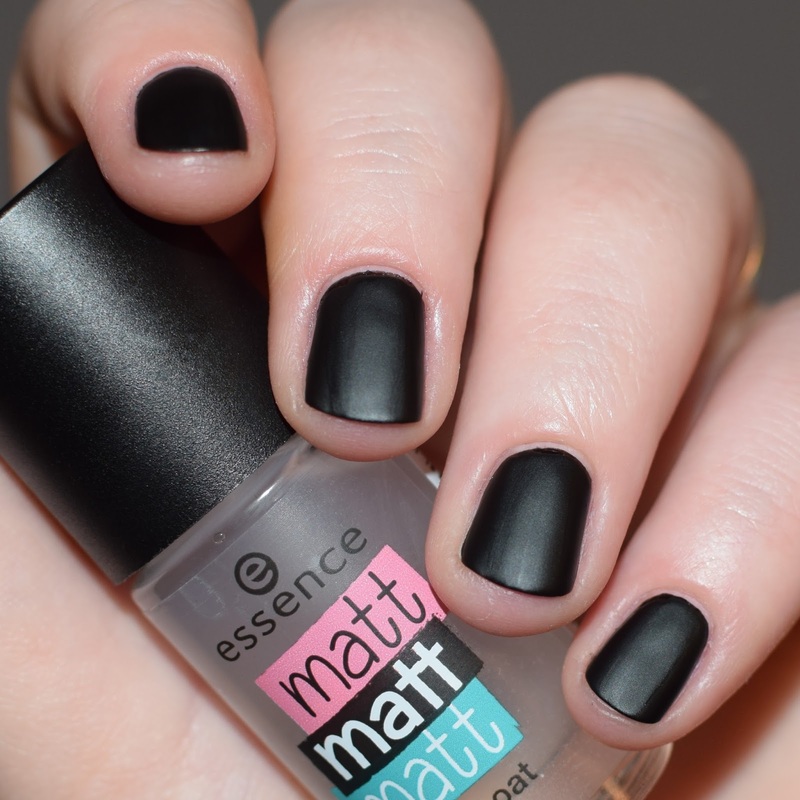 This is Essence's matte top coat, and I use this loads. If you follow my blog or Instagram, you'll have noticed that I much prefer matte nails to glossy, and I brought my first bottle of this a couple of months ago and finished it so went and brought another last week. This, like The Gel, works great as a stamping top coat. The finish is perfectly matte, and dries really fast. I compared it to Barry M's matte top coat and I couldn't see a difference between them. 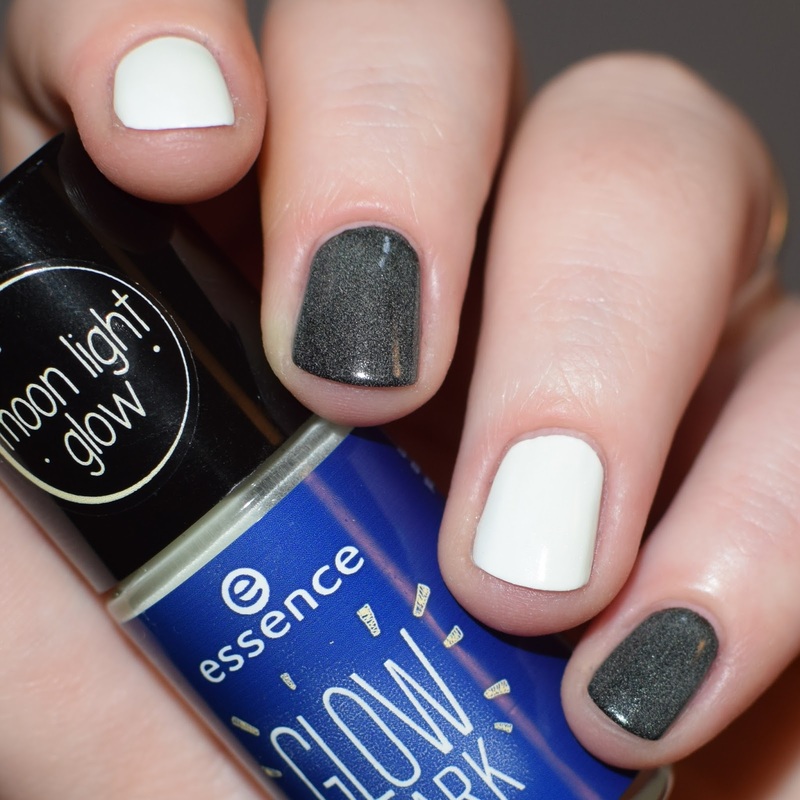 Essence's glow in the dark top coat, I was skeptical of this when I brought it because I wasn't sure how 'glowy' it would really be. But it surprised me when applied over a light base. 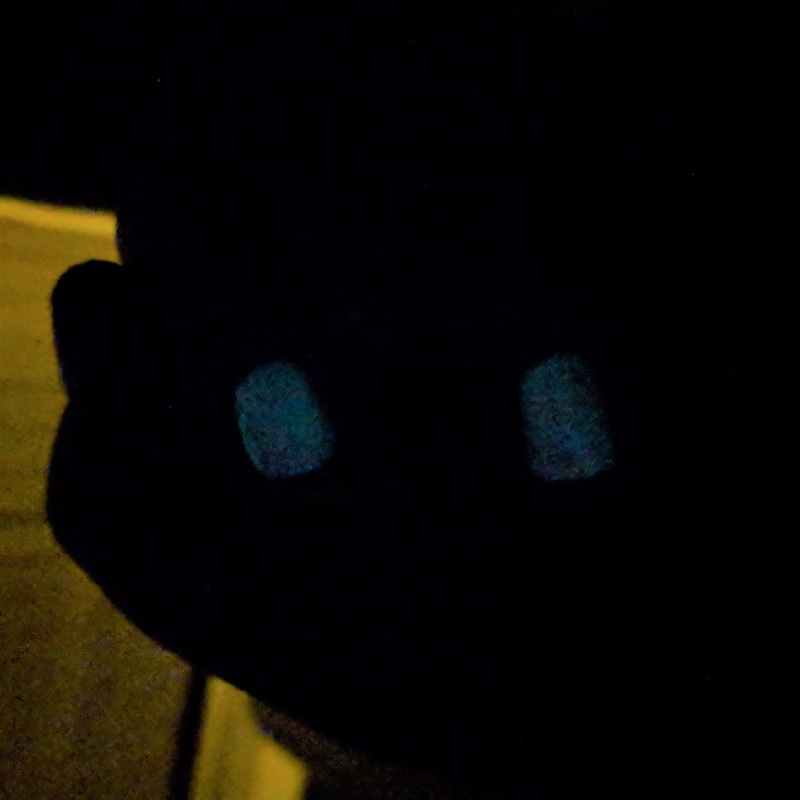 My nails did actually glow in the dark, it was super fun to stare at my nails when I was laying in bed in the dark. However this top coat does not work over darker base colours. For the swatch photos I used white and black and the black did not glow at all. (The glowing white was super hard to capture in a photo in dark lol). The polish does create a grainy finish over the base polish, which you can't see over white but is very obvious over black. I was wearing this other night in bed in pitch black and my husband freaked out "WHY ARE YOUR NAILS GLOWING!?" This is another top coat being discontinued by Essence, although it isn't as devastating a loss as Glamaxy. This is similar to Glamazy, is the sense that I don't wear it as a top coat, I wear it as a glitter topper, with another top coat over. 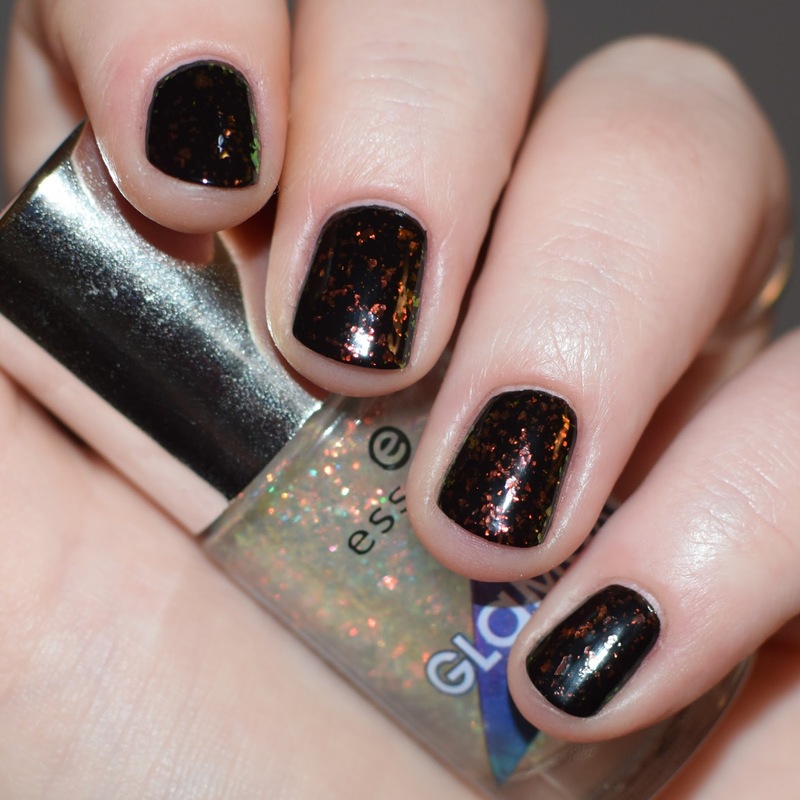 This polish is packed with silver and gold glitter, of different sizes. Although I'm not the biggest fan of wearing it over a black, I adore it over white, teal and gold shades. Adds something to spice up your more 'mundane' polish colours. Not mentioned: I also own the Metal Shock top coat, but I didn't include it as I only use it with the Metal Shock powders. You can see and first impressions and demo of the Metal Shock powders and top coat here. What is your favourite Essence top coat? Let me know by leaving a comment or tweeting me @nimynails.